Software-defined networking is a method of systematically designing networks from the ground up based on the key concept of centralized control over forwarding elements. To deliver and secure applications over SDN architectures, your network must be able to act based on the constantly changing state of flows, the applications-layer messages transiting the network, and the semantics of communications. 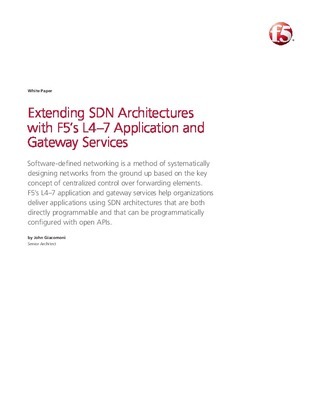 This exclusive resource discusses a solution that can help you to deliver applications using SDN architectures that are both directly programmable and that can be programmatically configured with open APIs.